Located in Pokhara, 458 m from Fewa Lake, Gauri Shankar backpackers hostel pokhara has a garden and rooms with free WiFi access. One mile from World Peace Pagoda, the property is also 3.1 km away from International Mountain Museum. Guests can have a cocktail at the bar. At the hotel, every room is equipped with a terrace. All rooms have a private bathroom with a bath and certain rooms will provide you with a balcony. Staff at Gauri Shankar backpackers hostel pokhara are available to give information at the 24-hour front desk. Mahendra Cave is 8 km from the accommodation. I had such a great stay here. 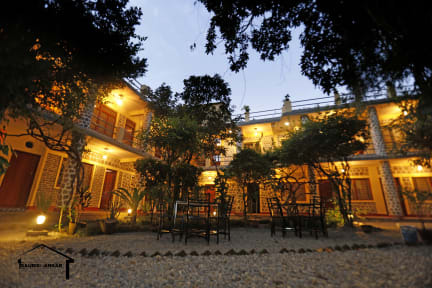 The place is super conveniently located to and from the Main Street Pokhara. And for the price, the facility (charging points are my lifeline) and the beds are soooo comfy. After a 12 day hike I really needed a big comfortable bed. And the staff is so friendly, especially Pramod, the manager made my stay so easy and we connected over a couple of beers and shared stories of our travels. Highly recommended! It’s a really chilled out hostel with a good atmosphere, good if you’re travelling alone. The staff are all very helpful and relaxed. Only issue is the doors to the rooms don’t lock but you can put valuables in lockers so not a big problem. Clean and comfy beds, perfect for pre or post trekking! Great location without being too noisy, and the food at the hostel is great and reasonably priced. Staff are super friendly and helpful and really enjoyed my stay here! Clean and friendly. Great spot, just round the corner from the bars and restaurants. Great stay location is perfect loads of nice bars and restaurants next to it, beds are large and comfy and the sheets are always clean and you get towels on checkin each room has a locker for you valuables, the showers are hot and good power, needed after trekking! Stayed in a female only dorm and the only disappointment was the bathroom didn’t appear to be cleaned daily, 4 western girls in one bathroom that toilet paper bin needs to be emptied daily, Great stay over all! The space is quite clean.